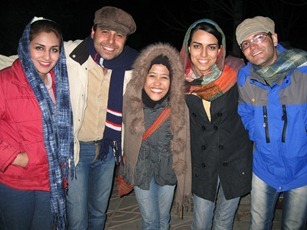 My travel partners, Ikmal and Nabilah, bid farewell as they left Iran for Dubai, UAE and eventually, Egypt. I’ve been to Dubai a few years ago, so I did not intend to visit that city again. I would rather stay for few more days here so I can get to know more of Shiraz and meet local Shirazis. I am supposed to board the plane bounding for Luxor, Egypt two days later to reunite with Ikmal and Nabilah. Unfortunately, my Egyptian visa which I applied in Jeddah, Saudi Arabia was rejected. The rejection came literally two days before I left for Iran. It crushed my entire properly-planned trip that I had been waiting for more than three years. How could they reject a visa application made by someone who was born in Egypt?! Appeal to the embassy was not an option and skipping Egypt was inevitable. I had to figure out Plan B and there seemed to be little options left. Flight ticket to Istanbul and hostel booking are finally settled and confirmed. I have been too busy planning my Turkey trip that I have completely been ignoring my host. Feeling rather guilty, I come out of the small room that they have dedicated to me and talk to my host Azin, her mom, and her sister, Ainaz. 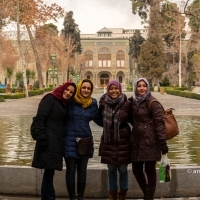 Azin used to study in Malaysia last year, but due to the sudden death of her father, she decided to go back to Iran and be with her family. She is younger than me by few years, but she is a tall woman with a beautiful pair of eyes and long neck. Beautiful big eyes seem to be in the family’s genes, as her sister is also blessed with such pretty eyes, hence Ainaz is her name (in Farsi, Ainaz means beautiful eyes. And yes, I’m going to name my daughter Ainaz! 😀 ). 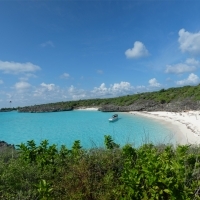 Azin tells me that the picnic is going to be quite laid-back and relaxing, which is perfect for me who needs just that. Her brother and sister-in-law come to fetch us and we go together to the picnic place. We arrive in a huge empty house with large garden. The location does not seem to be too far from Azin’s house, but my first impression is that whoever owns this house surely comes from a rich family. I realize that Azin and her family are quite wealthy — the fact that she was able to study in Malaysia with her parents’ support does tell their fortune. After all, Iranian rial is the world’s least valued currency, thanks to embargo that has plagued this nation since many years ago. This has disadvantaged many Iranians, but at the same time, it has made them somewhat independent. 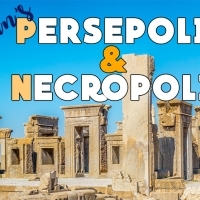 Although you can see Coca Cola, Pepsi, and other international brands being sold freely in Iran, many local products like cheese, yoghurt, and olives are in abundant. Where was I again? Oh yes, the picnic! 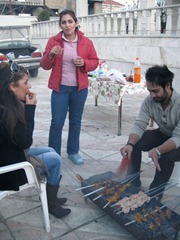 We set up the tables and chairs, prepare the shisha, kebab and chicken, and get ready for the BBQ. Azin’s friends finally arrive and I am introduced to them one by one. We chit chat, eat, chit chat, eat, chit chat, eat… it goes on and on until the sun sets. 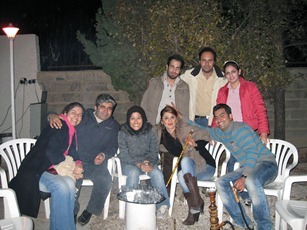 While they do that, two shisha pipes are used between 8 people. Some alcohol bottles are present and they tell me how they can get these alcoholic drinks from the black market. 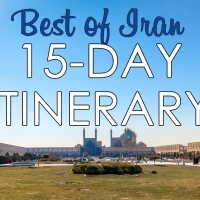 Despite being an Islamic country, just like Saudi Arabia, Iran is full of contradictions. There are many Iranians, who are often classified as “religious”, who don’t drink. But many of them who don’t practice the religion, do drink and party. You may see all Iranian women wearing modestly on the street, but what’s happening behind closed doors is very different. This is no longer a secret. Ask any Iranians and they will tell you the same thing. Anyway, the picnic is indeed a very laid-back and relaxing time to spend with friends and family. I really enjoy it. I’m told that Shirazi people like to do this often. They are known to be very laid-back people by Iranian standards. 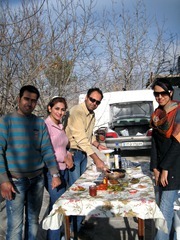 However, it seems that Iranians, in general, like to have a picnic. 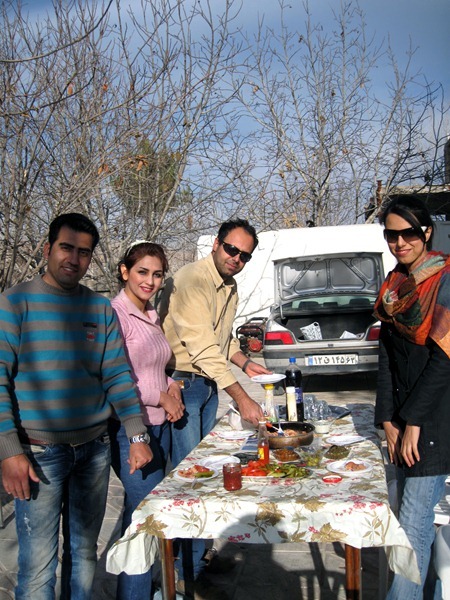 Along the banks of Esfahan’s river, I saw Iranians flocking to parks, gardens, and riverside to have a picnic with their family and friends when the weather was good.